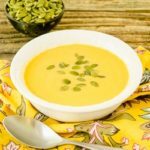 Creamy Celeriac Sweet Potato Soup is comforting and full of flavor. It's made with onion, celery root, sweet potatoes, apple, wine, broth, and thyme. Heat olive oil in a soup pot over medium heat. Add onion, celery, and 1/2 teaspoon salt. Cook until softened, stirring occasionally, about 5 minutes. Add garlic, stir, and cook for 1 minute. Add sweet potato, celeriac, apple, thyme, broth, wine, remaining salt, and pepper. Bring to a boil then reduce heat to simmer. Cover and cook until sweet potato and celeriac have softened, about 25 minutes. Remove and discard thyme sprigs. Working in batches, transfer soup to a blender and blend until smooth. Do not fill blender more than 2/3 full as hot liquids can expand when blending. Return blended soup to pot and stir in heavy cream (if using). Cook over low heat for 5 minutes. Garnish soup with pepitas or fresh thyme leaves.